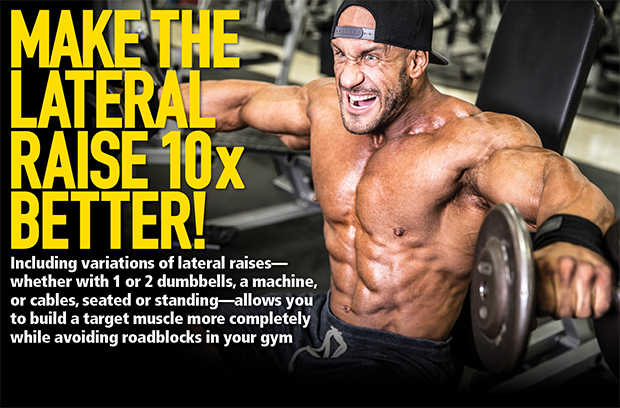 Make the Lateral Raise 10X Better! When there’s a big rig flipped over on the highway and traffic is jammed for miles, the first thing you do when driving is look for alternative routes rather than sit in gridlock. The same goes for your workout: When the gym is crowded—say, on a Monday—and there’s a lineup at the bench press, you can either wait, then wait some more, or you can look for alternative exercises that achieve similar results. Guys who don’t know better simply wait it out, which results in a 60-minute session ballooning to 90. But not you, because you know all the best alternatives that get you past roadblocks and on your way. Rather than wait for benches that seemingly everyone wants to use at the same time, you know how to make simple exercise substitutions using various pieces of gym equipment. Knowing the best alternatives to a given movement is useful not only in working your way around the gym bros but also because each variation is slightly different from its cousin. That’s an important benefit because each works the muscle in a slightly different manner and from a somewhat different angle, which encourages more complete overall development. A barbell, dumbbells, machines, cables, and the Smith machine each have their own advantages compared to the others, and no two work the muscle in exactly the same way. Ultimately, by including all those types of equipment in your workouts, over time you’ll work the muscle more completely and be less prone to growing stale. Here we’ll focus on a common middle-delt movement you might do on shoulder day—specifically, the lateral raise, a single-joint exercise for middle delts—and show the various ways you can do the same movementwith other pieces of equipment. The takeaway, we hope, is that you can apply the same thinking to other exercises, opening up a whole new world of ways you can work out. We’ll get into the nitty-gritty of the benefits of each as we go through the lateral-raise variations. This is a family of single-joint exercises for the middle delts that are done by bringing a weight out to your side (in the lateral plane) in a wide arc to about shoulder height, keeping a slight bend locked in your elbows. Good form requires that you keep your elbows up as you complete the move. Gym bros can’t seem to get the lingo right, so let’s set the record straight. The term raisesis necessarily single-joint in nature, whether to the front, side, or done for the rear delts. The side plane is also called lateral plane, so you can’tdo lateral raises to the front (as some claim). Nor is the middle delt also known as the medial delt (as others claim), even though the front is also called anterior and the rears are called posterior. It’s sloppy, but you can refer to the middle delts as side delts. This is the basic free-weight movement; when standing, you can use a little body English through your knees and hips to keep the weight moving. In the bottom position, if you let your arms hang straight down, there’s reduced stress on the middle delts—it’s actually picked up by the supraspinatus, a rotator-cuff muscle, so you can stop the downward motion a few inches outside your thighs. Watch your upper arm as you do this move: It should go straight out to your side and as high as possible. While the motion is the same as the standing version, when seated it’s much more difficult to cheat, therefore making this move harder. Most bodybuilders typically find they have to use less weight because they’re unable to generate momentum to get the weights going in the bottom position. This is considered a better isolation exercise than the standing version. This uncommon move has been spotted lately in gyms by bros who don’t know better. Because it’s harder to balance the weight, your grip and forearms have to work harder—but not the middle delts. It’s kind of like bench pressing on an exercise ball; your core works harder, but you have to sacrifice load to do it right. If you want bigger delts, this isn’t a smart trade-off. With the free hand on the top of a bench to stabilize your body, you’re able to train each side individually and better able to concentrate on boosting intensity, which is useful in bringing up a lagging side. When standing, you’re also able to generate a bit of momentum through your knees and hips. Taking dumbbells well past the horizontal plane—in this case, up to 45 degrees above—works the middle delts through a longer range of motion for more complete development. While the standing position allows for a bit of body English, the longer range of motion is more difficult, meaning ultimately you’ll have to use lighter weights. Therefore, it makes a great complement to lateral raises done to shoulder height. The machine locks you into the movement pattern, which is especially useful for beginners who have difficulty learning the proper movement pattern. Because you don’t have to worry about controlling the motion, it’s particularly beneficial toward the end of your workout when you’re highly fatigued. Setting the seat height is particularly important so you don’t jam your shoulders, so get it set correctly before adding load. With cables, the line of pull comes from the side, not straight down (as when using free weights). This means the angle of pull changes, hitting the middle delt somewhat differently than when using a dumbbell. Also, in the bottom position, the middle delt isn’t resting because there’s still tension on the muscle (as long as the plates aren’t touching down on the stack). With the cable running behind your body, the angle of pull again changes slightly (stand just a bit forward of the cable so it runs smoothly behind your back), working the middle delt with another slight variation. As with the version in which the cable runs in front of your body, there’s no resting spot at the bottom of the movement because tension is still on the muscle. When you lean away from a stationary post, your working arm is hanging straight down at the bottom of the exercise, which already means the bottom 30 or so degrees of the movement is eliminated. This isn’t really a problem because the middle delt isn’t actually the prime mover over the bottom third or so of the range of motion—the supraspinatus is. Past that, the middle delt takes over, and you in fact get the benefit of taking the move beyond the normal ROM when bringing the weight to shoulder height, so the middle delt is actually working overtime. In this position, you can generate some body swing to help get the dumbbell moving.